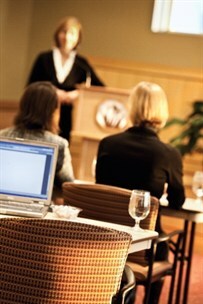 South Franklin Circle offers full service accommodations for meetings, parties, receptions and special events. Unique in the Chagrin Valley, the Chautauqua Room’s simple elegance offers a customized audio-visual system, stage and private deck overlooking South Franklin Circle’s naturally landscaped surroundings. Particularly well-suited for dinner parties, rehearsal dinners, reunions and receptions, it is easily adapted to accommodate meetings of any size including presentations and performances. Intimate setting that is ideal for a private dinner, luncheon or brunch. A magnificent lobby space with striking stone fireplace, Radius Dining Room Bar, adjacent outdoor private deck with outdoor fireplace, and soaring windows with spectacular views, is available for semi-private gatherings. It is ideal for cocktail receptions, an elaborate hors d’oeuvre buffet, or desserts and coffee before or after events in the Chautauqua Room.